These are the days observed with special importance, in the order of their occurence during the year. Bada Guruvaar : The Thursday that follows the night of No moon (Amavas) every month is celebrated and named as Bada Guruvaar. Everybody offers a Prasad of “Meethi Phuliyan” at Gurgaon sthaan. Seva starts at 5:15 A.M. in Summers and at 6:15 A.M. in Winters. Such is the power of Gurudev, that at the time of offering of prasad, anyone who makes a wish with a pure heart, gets what he wants in life. The “Shishyas” of Gurudev devote the complete day in Seva at the Gurgaon Sthaan. A prasad of “Khichri” and Tea is served to everyone. Gurudev’s disciples also visit Neelkanth Dham in large numbers. 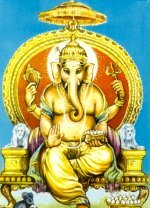 Ganesha Chaturthi : The day devoted to Lord Ganesha. It comes about 80 days after the day of “Deepawali” every year. All disciples of Gurudev keep a fast on this day. During the fast not even water can be consumed. The fast is opened after Moonrise with the Prasad of Laddoos made with “Gud” ( Jaggery ) and “Til” ( Sesame ) alongwith tea which also contains “Gud”. The Prasad of Laddoos is distributed to all by our most Respected Guru – Mata with her own hands. Thousands of people visit the sthaan and take the “Prasad”. 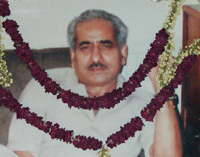 Basant Panchmi : Gurudev’s Birthday. It falls on the day of “Basant Panchmi tithi” according to “Vikrami Samvat” (Hindu calender). Though, according to Guruji, His Birthday falls on the day of “Maha Shiv Ratri”. Basant Panchmi falls in the month of February and sometimes in January every year. The day is celebrated with much joy and happiness every year. People in large numbers offer their prayers at Gurudev’s Samadhi at “Neelkanth Dham”. Langar starts from the Morning hours and carries on till late in the evening. Thousands of people flock in, have Darshan of Samadhi, take blessings of Mataji and eat the Prasad (Langar). Though such a huge crowd, continues to exist the whole day, there is complete silence and discipline and people come in queues, chanting mantras within. A total divine and blissful atmosphere carries on throughout the day. 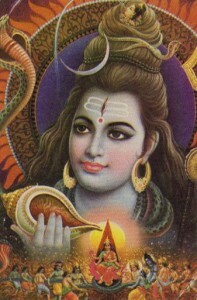 Shiv Ratri : The day of Lord Shiva. It is the day, when Lord Shiva, rises from his prolonged Samadhi at 12 in the night. Shiv Ratri is a major festival observed by the disciples of Gurudev. It comes about 40 days after the day of “Ganesh Chaturthi” every year. Starting from the morning, on the day of the festival, people offer their prayers at the Gurgaon sthaan and offer “Bel” (A fruit), “Bel Patra” (The leaf of Bel) and “Dhatura” (Another fruit). All these are liked by Lord Shiva. Likewise, a “Nirjala” fast ( Fast without consuming even water ) is kept by all on this day. The fast is broken after midnight with “Alu Ka Prasad” and “Nimbu Ki Chai” ( Lemon Tea ). Prasad is distributed at Gurgaon to all. This Prasad is unique, in the sense that Gurudev himself created it for his disciples and Bhakts. Since people from all over India come to join in this festival, the arrangements of their boarding and lodging is done at the trust building in Gurgaon. Langar starts 3 – 4 days before the festival and is carried on till 2- 3 days after it. Guru Pooja : The day of Gurudev. It comes on the day of “Poorna-Maashi” ( Full Moon Night ) in the month of July every year. Disciples offer their prayers since early morning on this day at the sthaan in Gurgaon. A coconut wrapped in a Handkerchief is offered at the sthaan which is returned after “Tilak”. The Handkerchief brings Good – luck throughout the year. A prasad of “Meethe Chawal” ( Sweet Rice ) is distributed to all. Langar starts 3 – 4 days before the festival and is carried on till 2- 3 days after it. 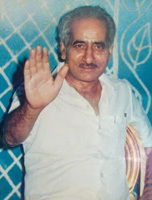 Nirvana Divas : The day Gurudev left His human form. It comes 2 days after “Guru Pooja”. Even though Gurudev is a power residing everywhere, his Human form was so enchanting that no-one of His disciples has been able to forget it. The lucky ones who have seen Him, feel proud to narrate their experiences to others. People throng in large numbers at “Neelkanth Dham” to pay homage at His Samadhi. A prasad of “Chane” and “Halwa” is distributed to all. Dhan Teras : It comes two days before the festival day of Deepawali, on the day of “Teras” according to Hindu Calender. Devotees take a silver coin of Shree Lakshmi Ji and Shree Ganesh Ji to the “Guru Sthaan”. This coin is blessed and given back to them. 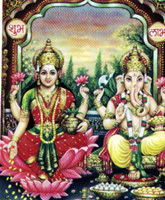 Lakshmi Ji is the goddess of fortune and beauty. Ganesh Ji is the God who grants Luck and protects from evil. This blessed coin is auspicious to bring good luck and fortune to the devotees throughout the year. The coins are worshipped for 41 days starting from the day of “Maha-Lakshmi Pooja” (Deepawali). The coins have to be adorned with a “Tilak” everyday during these 41 days. After the completion of the 41 day “Pooja”, the coins can be kept in a safe place and can also be used for the same “Pooja” in the years to follow.